Antiquaires since 1970, siret: fr 24.430113233. Key strong xvii-seven, henri iv, and his little sister. Large and beautiful key, hollow hollow stem: (diameter 1,5cm). Forged thick ring, large zig-zag bit. 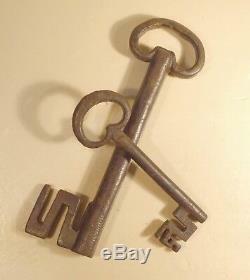 A very decorative key of 15,5cm its small on 10,5cm. More neat, full stem, finely made 10.5cm. Good condition, small cleaning or light polishing, nothing. Dimensions: small: 8cm x 4,5cm x 3cm. Our warranty commits us as follows. We are not experts, but we refund 100%, without questions and with our apologies, any person disappointed by our sending, within the reasonable period of 15 days. No risk for our customers! The sending of this object 0 for France, and 20 for Europe. 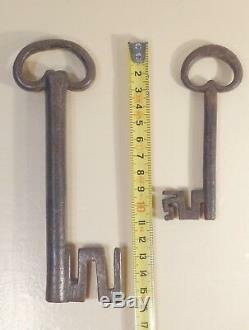 Strong french key, 16-17thc, renaissance, and its little sister. 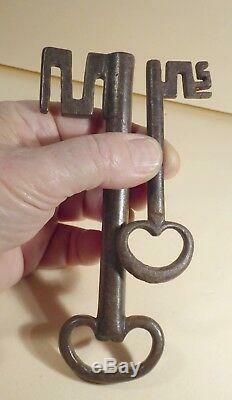 Large and beautiful key, thick hollow stem: (diameter 1.5cm), thick forged ring, large bit of zig-zag. 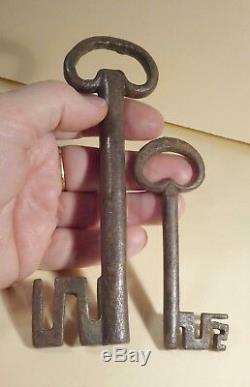 A very decorative key of 15,5cm, and we add its little sister of 10,5cm, more neat, full rod, more finely done 10,5cm. The item "strong key xvi-seventeenth century, henri iv, and his little on" is on sale since Monday, March 18, 2019. It is in the category "art, antiquities \ objects of the nineteenth and before". The seller is "dany46" and is located in bellegarde, in camargue. This item can be delivered anywhere in the world.